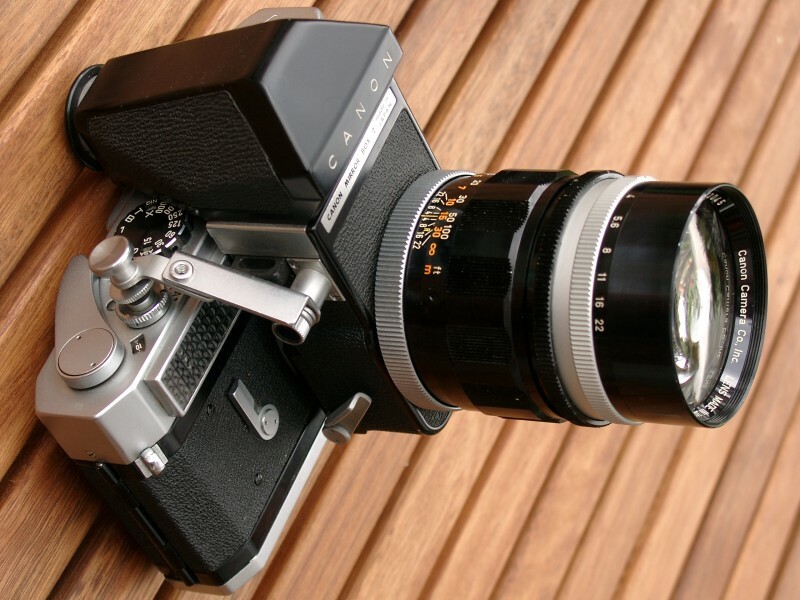 The Mirror-Box 2 was established to connect lenses the 2.5/135mm and any longer lens to the Canon 7 rangefinder camera. It includes a prism with upright, non-reversed view and a bright fresnell screen. The box is connected to the outer bayonet mount of the Canon 7 in a way similar to the 0.95/50mm lens, and the lenses are mounted to the box in the same way. The system operates without cabling. By pressing the trigger arm, the mirror moves upward out of the way (no rotation), then the camera is released. The mirror stays open after exposure (no instant return mirror). The small lever next to the self timer lever when mounted, will return it to the down position. The lens is a preset type with two aperture rings. No automatic aperture mechanism anyway. 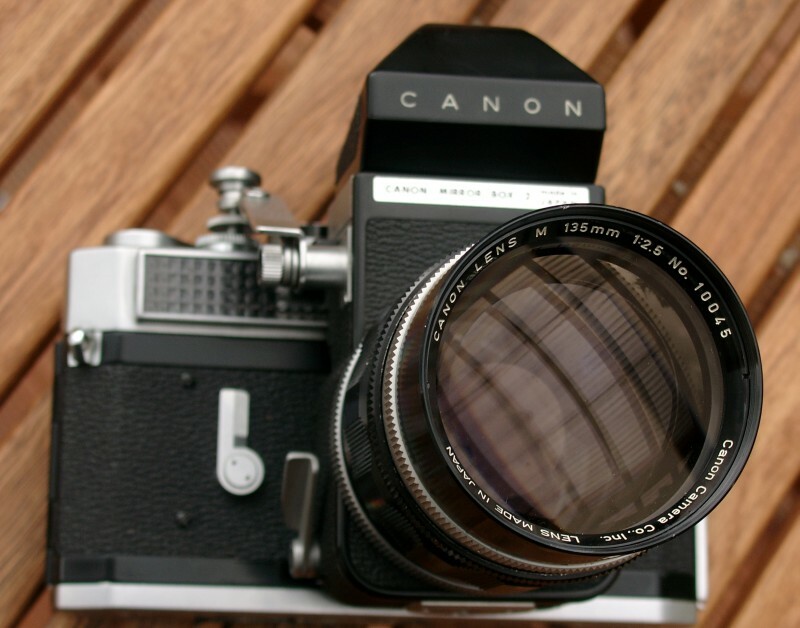 Most Canon Rangefinder lens series starts with S/N 10.00x. The number of this lens indicates that the "M-series" (which hasn't to do anything with Leica M) wasn't a particular big run. 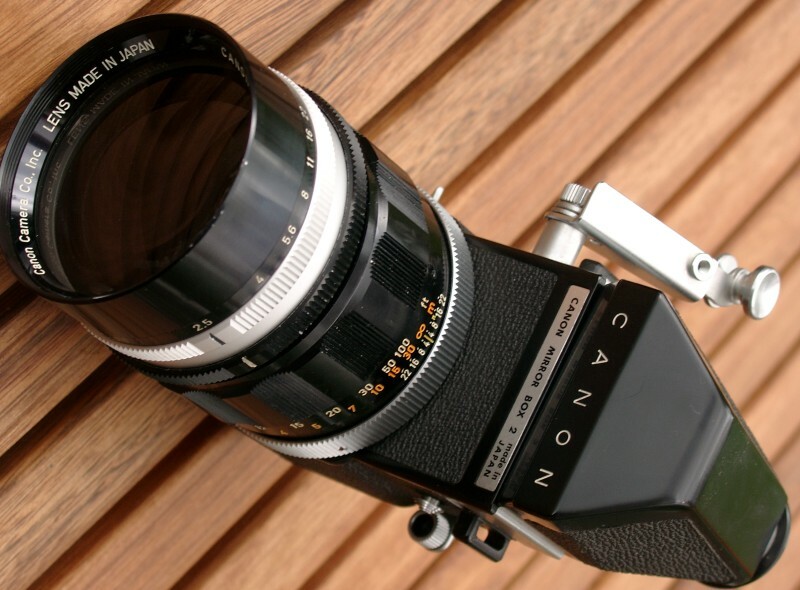 Optically, it was the same lens as the Canonflex (SLR) lens 2.5/135 (started 1960). It was also produced in FL mount (the M-lens is 2.5cm shorter than the FL lens). In fact, all FL lenses can be mounted on the Canon Mirror Box, but will work as "macro" lenses and will not focus to infinity because they are "longer" and designed for a smaller film-to-flange-distance. What Canon told about this lens: "It lives up to its name as a first-class large-aperture 135mm lens due to high performance shown by the stable performance of a 4-group/ 6-element symmetric (gauss type) optical system, the practical utility of telephoto 135mm, particularly the brightness of f/2.5, clearness without flare even at full aperture and uniform resolution throughout the entire frame provided by strict compensation of chromatic aberration." *) Release date according to Canon Camera Museum. The previously build Mirror Box (1) had screwmount (LTM) on both ends. CANON had faster lenses available when compared to Leica, but some drawbacks in handling. 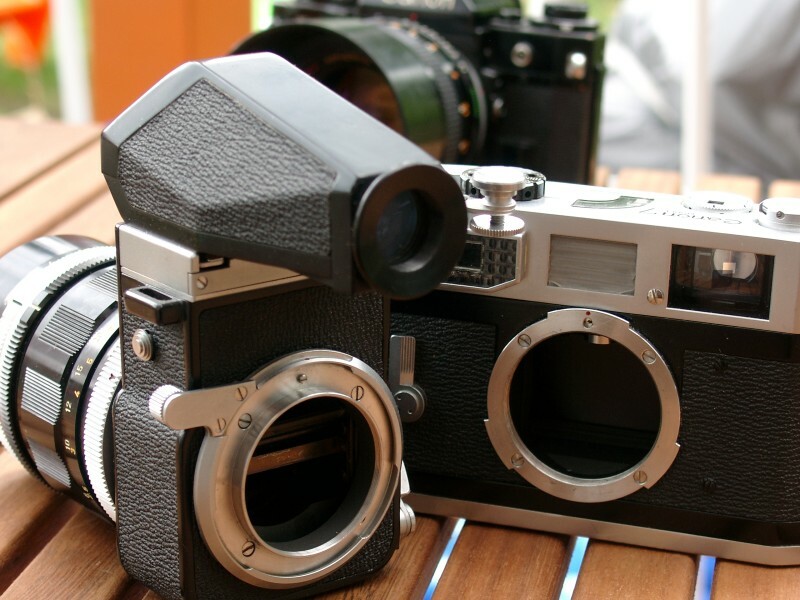 The MB2 was superior to the Leica Visoflex II, but inferior to the later Visoflex IIa and III which had instant return mirror. The CANON lenses were solely to be used with the Canon 7 rangefinder system, whereas the Leica Visoflex lenses could be used with the Leica M as well as with the SLR system (Leicaflex or Leica R). Perhaps this was a main reason why sales of the MB2 was low in comparison - although Canon surpassed Leica in general sales of Rangefinder cameras in the beginning 1960's. Obviously Canon concentrated on the SLR products and never saw a reason why to update the MB2. Perhaps there was only a single production run, made when the Canon 7 was released. For its rarity, usual collector's price (200-400 USD) is low.